Despite recent troubles, the promising sector has had a good run. The biotech sector has taken a bit of a beating, down about 24% this year as measured by the iShares NASDAQ Biotechnology Index ETF, and down about 35% from last year's peak. And yet, if you zoom out a little further, the biotech sector is up 141% over the last five years, absolutely trouncing the S&P 500. 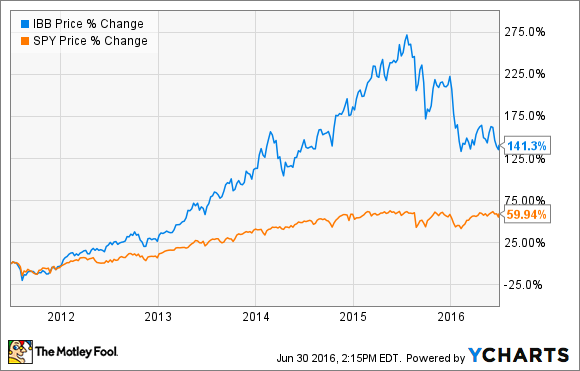 Can biotech get back to its market-beating ways? I think so. The main reason for the decline comes from generalist investors fleeing the sector for safer options as the broader market has moved mostly sideways. It's not like biotech's risk-reward proposition has changed that much. So it stands to reason that, if the generalist investors return, we'll have more buyers than sellers, and the sector will rebound. Fortunately, there are a couple of ways investors could be lured back into the sector. We saw some mergers called off when the tighter rules about tax inversions were enacted. Pfizer (NYSE:PFE) called off its acquisition of Allergan, and AbbVie did the same with its deal with Shire. Pfizer subsequently announced a deal to buy Anacor Pharmaceuticals, but that was only a $5.2 billion deal, not exactly a big-time acquisition. A bidding war for Medivation certainly would be nice. Sanofi has expressed interest; but to get things heated up, we really need another company or two to bid up the price. There have been plenty of rumored suitors, but that's sometimes a tactic that investment bankers use to get a bidding war going, rather than a sign that one's already started. Gilead Sciences (NASDAQ:GILD) is one company that investors should be looking to as a weather barometer for acquisitions in the biotech space. The company has $21.3 billion in the bank, making it easy to make a major purchase in line with its $11-billion acquisition of Pharmasset in 2011, which brought a blockbuster hepatitis C drug to Gilead. Perhaps less likely, but definitely more exciting, would be if a large pharma were to take out Gilead, or one of the other large biotechs. The acquisition would be a sign that pharmas think the valuations have fallen enough to make them good buys, raising the rest of the boats. Nothing gets investors more excited about biotech than drugs that can treat a disease in a brand new way. We saw that with Gilead's hepatitis C drugs. We've also seen quite a bit of success in cancer immunotherapy, although much of that has been dominated by larger drugmakers such as Bristol-Myers Squibb and Merck. The next big thing could be gene therapy, which has had a rocky history over the last decade or more, but appears to be coming into its own. Spark Therapeutics (NASDAQ:ONCE) reported positive clinical-trial data for SPK-RPE65, a gene therapy that treats rare blinding conditions. Spark Therapeutics is already in the process of submitting its application to the FDA, and has quite a few other gene-therapy programs further behind SPK-RPE65. bluebird bio (NASDAQ:BLUE) is working on gene therapy for blood disorders. Its LentiGlobin program has show promise in both transfusion-dependent thalassemia, and severe sickle-cell disease; but bluebird bio needs to optimize the treatment to get higher expression of the gene. Investors will get an update in December when bluebird bio presents data at the American Society of Hematology meeting. The value of a development-stage biotech is determined by its pipeline, risk adjusted for the potential that the drug will be approved. Other things being equal, a biotech that has an 80% chance at getting its drug approved is worth more than one that has a 60% chance. A lot of that chance has to do with a guess as to how the FDA will act on drugmakers' marketing applications. When investors are convinced they're not going to get blindsided by regulators, they raise their risk-adjusted valuations. A true test will come shortly when the FDA decides on Sarepta Therapeutics' (NASDAQ:SRPT) DMD drug eteplirsen. The agency was scheduled to make a decision last month, but delayed that decision indefinitely, and subsequently asked Sarepta Therapeutics for additional data. The original data package was less than perfect, mainly due to a small number of patients in the phase 2 trial that was never really designed as a pivotal trial. The FDA's committee of outside advisors recommended against approving the drug, but the fact that the FDA didn't issue an outright rejection hints at the FDA's willingness to be flexible. Sarepta Therapeutics has already started a phase 3 trial, and has plans for an additional trial that might make the FDA willing to issue an accelerated approval if the new data satisfies regulators. If the FDA approves eteplirsen, Sarepta's shares will soar. More importantly, it'll give investors confidence in the overall ability of biotech companies to get drugs past regulators.